“Historically, women in Malawi have had low representation in elected positions in local committee, local councils and National Assembly partly because there is still a prevailing traditional perception as to the role of women in the social and political spheres. “Even though women do vigorously participate in the political process including in mobilizing, registering, campaigning and voting, they do so on behalf of male candidates in the larger part. Something is wrong somewhere, there is great disproportion”. These were the opening remarks by Commissioner Mrs Elvey Kalonga Mtafu during the opening of the Building Resources in Democracy, Governance and Elections (BRIDGE) course on Gender and Elections for MEC staff, political parties, civil society organisations and Ministry of Gender. The training has been organised with support from the European Union Democratic Governance Programme from 1st to 4th September, 2015 in Blantyre to sensitize the participants on the importance of women’s empowerment and entry points for gender mainstreaming in the electoral process. The workshop also aims to inform civil society organizations and women’s advocacy groups about strategies to promote women's participation in electoral processes, provide tools for all participants to critically assess elections from a gender perspective, and offer networking opportunity for women’s advocacy groups. Commissioner Mtafu said increasing women representation in elected positions was a colossal job to be left to one institution and there was need for concerted efforts of all stakeholders to level the playfield for women participation. “Female candidacy is an important indicator of the maturity of our democracy which requires renewed attention and support. As much as the Commission would want to push this gender equality agenda, we are limited in our interventions. We need you also to play your part,” she said. The Commission in the past Tripartite Elections and all subsequent by-elections gave a 25 percent discount on nomination fees for female candidates as a way of encouraging their participation in Parliamentary and Local Government Elections. “We are yet to appreciate the impact of this gesture as the number of women MPs in the 2014 elections was lower than before. Only 30 women made it to Parliament and 53 to the councils. During the 2009 elections 43 women made it to Parliament. 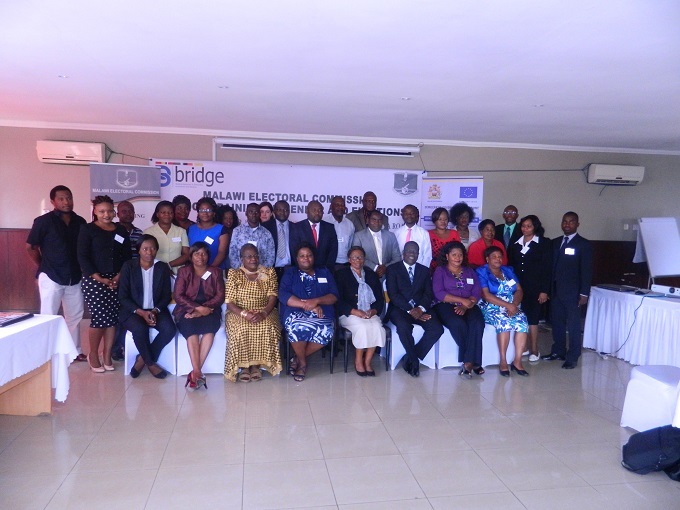 The BRIDGE training on gender and elections comes five days after announcement of the official results for the Local Government By-elections on 25th August, 2015 in five wards. There were 29 candidates who competed in the by-elections but only eight were women. Khwawa Ward did not have any female candidate while Central Ward in Zomba shined by having four women out of the six candidates of which one came out victorious. “This reversing trend is worrisome. We all need to join hands and deal with its structural causes. We have included political parties because we know candidates come from political parties and some of the hindrances that choke women participation can ably be dealt with by political parties,” she said. Commissioner Mtafu observed that the play ground was not level for women as they face intimidation and most cannot withstand violent and turbulent processes leading to party nominations.